When Tim Cook and his executive team took center stage at the Moscone Center earlier on this month, it didn’t come as any great surprise when they mentioned that the new Maps app is Apple’s in-house solution and they are ditching Google Maps altogether. The fact that Apple has been building their own maps system had been widely reported on during the build up to WWDC 2012, with Cook and his cohorts only serving to officially confirm that it was happening. We all have to wait until the official release, or at least the Gold Master release of iOS 6 until we see exactly what the finished Apple mapping application will look and function like, but the initial beta shows that the vector-based creation does have a lot of potential, especially with the inclusion of turn-by-turn navigation and 3D city views. The fact that Apple is building this mapping application spells the end for Google Maps on iOS devices, a bitter blow to Google even if they won’t come right out and say it. After all, Apple would have been paying a substantial licensing fee to Google for the privilege of using Maps on all iOS devices. We look forward to providing an amazing Google Maps experience on iOS. It isn’t exactly the most earth-shattering announcement, considering we all pretty much expected something of this nature from Google. The iOS audience is such a huge worldwide market that Google would be crazy to dismiss them in favor of other ventures. 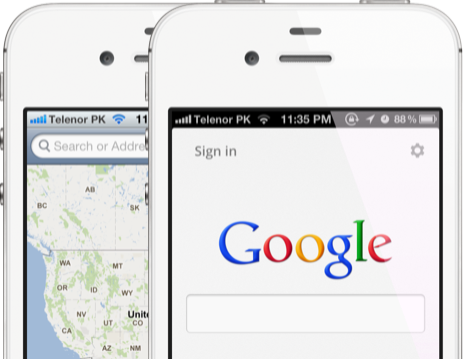 There will inevitably be a lot of users who have become so used to using the familiar Google Maps app that they will more than likely prefer familiarization over whatever Apple will bring with the final build of iOS 6, meaning a Google Maps app could be extremely successful. Whatever Google have up their sleeves, it will be extremely interesting to see how this one progresses.